Very often users don’t associate the shopping cart and checkout pages with the intention to buy something, and they can go to these pages for different purposes. Merchants only consider these pages as the final steps of purchasing products, but users may have other ideas, and we review them in this article. 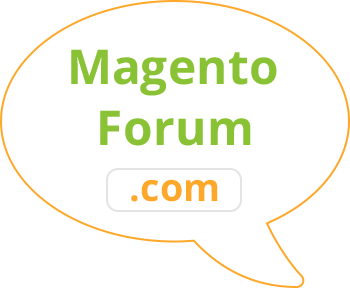 It should be noted that the shopping cart and Magento one step checkout can be implemented as 2 different pages in your online store. 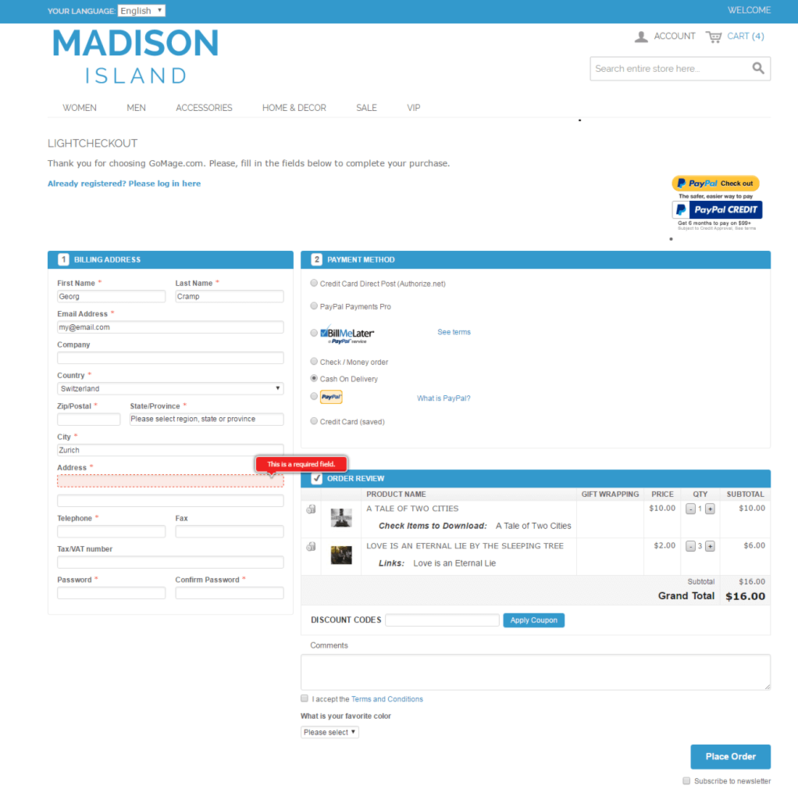 In the example below, the shopping cart is not displayed as a separate page, but as a drop-down box, so the user can see the cart and edit the information in it staying on the current page. The information in the cart block is updated without the need for the full page reloading, which is very convenient for users. In practice, there can be various approaches to the development of these pages. There is One Step Checkout example. Getting a buyer to register before purchasing products does have its advantages. After all, you now have their contact information (email, address, phone number, etc) and can send promotions to them regularly. On the surface, this looks great, but in reality, you also increase the possibility of your potential buyer simply leaving your site. This would have a direct and negative impact on your sites ROI which is certainly something you would not want to experience. So how do you secure your client details without losing sales? First, with your onestepcheckout process offer the ability for purchases to be made as a guest. In other words, people would not need to give their personal details just to secure products that were sent to a given location. Second, in order to encourage people to provide you with such details as their email address why not incentivize the process via a discount or promo offer for those that leave their details? The point here is to make the giving of details a reward of the process rather than an inconvenience to be dealt during the purchasing process. While our world continues to shrink we still speak different languages. Unfortunately, far too many eCommerce sites ignore this fact and offer their merchandise in whatever their preferred language might be. When it comes to a onestepcheckout purchase process the more convenient you make it in the eyes of the viewer the greater the possibility that their appreciation will shine forth through the successful completion of their purchasing process. Speaking of convenience, why not allow your buyer to take charge of when their package will be delivered within the one-step process. Perhaps they will be on an extended trip or don't want weekend delivery. Empowering their ability to control these aspects of the purchasing process not only increases the possibility of completed purchases but also builds customer loyalty which means they may buy more in the future. Let's say your customer owns a brick and mortar store location that is closed for the weekend and due to the holiday they won't be back in the office till Tuesday. Your delivery driver drops the package off on Saturday. Thus the package is subjected to theft from that point on Saturday, through Sunday and Monday, and until they arrive back into the office on Tuesday. Had your buyer been able to select what date to have their purchase delivered this entire lack of security could have been avoided. 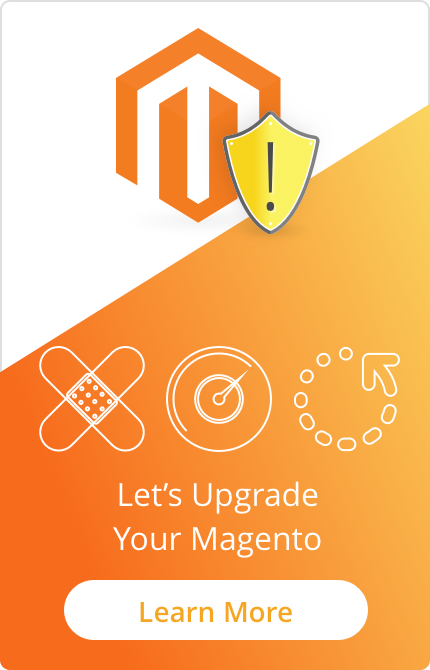 Here your Magento one step checkout process can be enhanced by allocating default shipping methods based on the geographical location of the IP address making the transaction. Your customer would still have the ability to adjust shipping to their preference if the actual delivery location is located in a geographically different region than the IP actually making the purchase. However, customers are likely to appreciate the increased convenience of your checkout process. Not all carriers are equal in all locations especially when it comes to the topic of shipping outside a given country. Proactively being in the driver's seat of your clients best interest will increase their appreciation of what you are doing online. HOT TIP: Happy customers buy more and are more likely to return based on their previous experiences with your company. Speaking of increased convenience, making sure that the right address has been entered is a huge part of making this entire process a successful venture for everyone involved. One of the biggest ways that people's orders get messed up involves their entering the address incorrectly. Their error reflects poorly on your store even though it was not your issue. Cut through the red tape of confusion in your own onestepcheckout process by using the power of address validation within each and every transaction made. Before making the purchase final customers need to be able to review all the details. This is the point where they can make adjustments if they have entered something incorrectly. Not only will this increase their confidence in your ability to deliver but it will also decrease your frustration of having to correct errors that they made in the process of making their purchase. One more way to increase buyer convenience is found in offering autocompletion. From a customer perspective, it can be frustrating to have to enter all details into every form. Especially, if those details have been entered on a previous visit. Increase ROI sales by offering to autocomplete form fields. If the details are different the buyer will advise, but if they are the same then typing issues become minimal. This process works by suggesting potential ways to complete cells and or multiple form details as your buyer enters details into the form fields. Instead of requiring that they type absolutely everything out manually they are empowered to simply click what is correct thus speeding up the process and decreasing the inconvenience of having to enter everything into your one step checkout form fields. 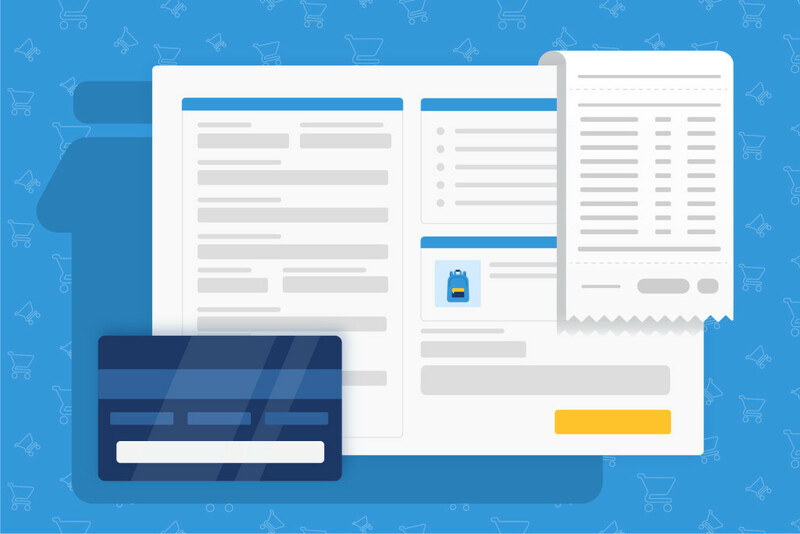 So far we have taken a look at how the actual one-page checkout process can be enhanced. Implementing just some of the ideas covered would be invaluable to your success. However, what about after the sale has been made and on the "thank you" page. Does your page simply thank the buyer for the purchase and then move on? This is not bad, but it can get better by doing one or more of the following. 1. Offer a cross-sale, upsell or discount for additional purchases. 2. Present a survey, contest, or drawing for them to participate in and win. 3. Suggest an article, podcast or video that they might appreciate based on the purchase that they have made. Another idea would be found in suggesting at this point that they follow your social media profiles if they haven't already done so previously. This way they can keep updated on new items that you bring out, as well as discounts, specials, and other sales opportunities wherein they can save their income and expenses. The point is, that the person who is on this page has completed the purchase 100%. Obviously, they are interested in what your eCommerce solution is offering or they would not have invested their hard-earned capital in the process. Done right, this group of people is in the right place at the right time for engaging with your store even more. Don't lose the opportunity by simply thanking them and letting it go at that. What purposes can customers use the shopping cart and onestepcheckout pages for? This is the most obvious purpose, especially for the shopping cart page. 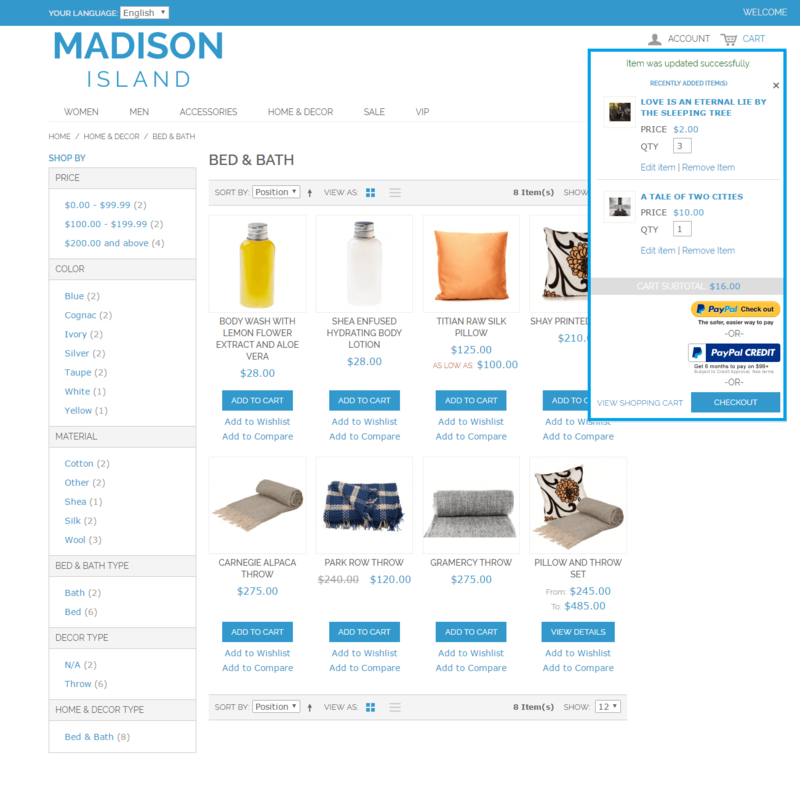 Users can add several products to the shopping cart to make a final decision later. like they would in a brick and mortar shopping experience. You can put a lot of items in the cart, but before taking them to the cashier, minds can be changed. Online and offline shopping can be an entertaining experience, and adding products to the cart is a part of this process. In other words, the shopping cart can be used as a wish list even if you have a “wish list” option available in your store. Also, it is the right place to check the size, color, quantity and other characteristics of the selected products. If a user is going to buy something expensive, this stage is very important because the decision-making process can be difficult. For whatever reason, some users are subconsciously expecting a dirty trick or deception related to product price. Such users prefer to check the final price to be sure that there are no surprises. They may do this on the shopping cart page. But as you know, accurate shipping costs and taxes can only be calculated at the final step, when a user fills in all the details about themselves. Therefore, the most meticulous and suspicious users prefer to go to checkout in order to review these details. They may not be ready to make the corresponding purchase but only want to see what their total cost will be. Even if you provide all the information such as product price, tax value and delivery costs for each region on the product pages, some people would prefer to use the checkout page to confirm the total purchase price. If a user adds several products to their cart, a variety of ads or promotions may become available to them. These are usually shown on the shopping cart page. Further, some stores allow discounts starting with a specific order cost, so a user may be given the option to add certain products to their existing list in the cart in order to reach the necessary total. Incentives may include free shipping or a more attractive discount. For example, when the order total is above $100, a discount becomes available. If your online store is popular, it attracts the attention of both potential customers and competitors. In order to perform their marketing research, they can register, search for products, add them to cart, and even make test purchases to communicate with your customer service team. One of our clients told us that the reason for increasing the percentage of abandoned carts was that their main competitor had organized a focus group to compare the service quality. All participants did a search for some products and added them to carts, and these activities strongly influenced the online store’s conversion rates. One merchant – the owner of an online jewelry store – told us that their female users add products to carts to dream about jewelry. It's like a visualization of desire. In the Home Decor Online Store, a user added some products to a cart and then gave their interior designer access to the account to confirm all the items. The designer made corrections in the order before final purchases were made. It is important to remember that there is a percent of users that are not going to buy anything. They press the button “add to cart” for no reason or just out of curiosity. There is nothing you can do about them. So, as you can see, not always adding products to the shopping cart and even passing to the checkout process means that users are going to buy something. For merchants, it is very important to monitor the abandoned cart rate carefully and compare it with previous periods. If it is not increasing, you have no reason to worry.